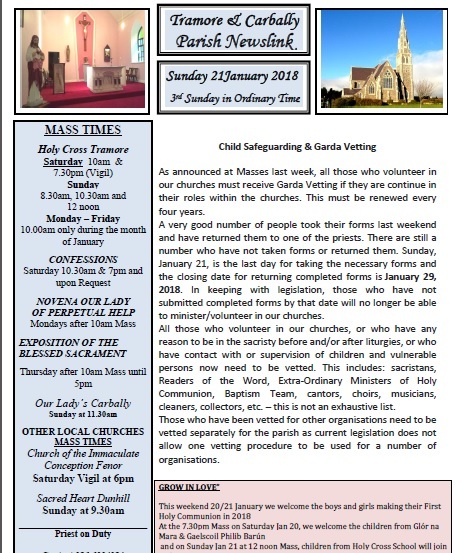 As announced at Masses last week, all those who volunteer in our churches must receive Garda Vetting if they are continue in their roles within the churches. This must be renewed every four years. 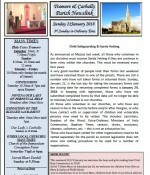 A very good number of people took their forms last weekend and have returned them to one of the priests. There are still a number who have not taken forms or returned them. Sunday, January 21, is the last day for taking the necessary forms and the closing date for returning completed forms is January 29, 2018. In keeping with legislation, those who have not submitted completed forms by that date will no longer be able to minister/volunteer in our churches. All those who volunteer in our churches, or who have any reason to be in the sacristy before and/or after liturgies, or who have contact with or supervision of children and vulnerable persons now need to be vetted. This includes: sacristans, Readers of the Word, Extra-Ordinary Ministers of Holy Communion, Baptism Team, cantors, choirs, musicians, cleaners, collectors, etc. – this is not an exhaustive list. Those who have been vetted for other organisations need to be vetted separately for the parish as current legislation does not allow one vetting procedure to be used for a number of organisations.